He really thought he was the Big Cheese! He was a mighty King after all. All he had to do was give a command, and his servants scrambled to do it. King Ahab didn't need God. Instead of trusting in God for all things, King Ahab trusted in himself. King Ahab thought HE was in charge. He didnt pray to God - God would want him to do things Gods way. Instead, he prayed to idols, because they would do things HIS way. But God was about to teach him who the REAL Big Cheese is! And so God sent the prophet Elijah. It will not rain, or will there be even any dew on the ground until the one true God says so! Elijah said to the king. Then God told Elijah to go and hide away. King Ahab was on his own now. Now he would learn who REALLY is in charge of all things. And then, just as God had promised, the rain stopped. Meanwhile, God was taking care of Elijah. He showed him where there was a small stream so he would have water to drink, and he sent ravens that brought him meat every morning and meat every evening. This was an amazing thing! But then, our God is an amazing God, and even in the toughest times, he takes care of those who trust in him. But, after a while, the stream dried up because there hadnt been any rain for so long. Now what was Elijah going to do? And so Elijah did exactly what God told him to do (thats always a good idea!). He packed up his things and made the hot dusty walk to Sidon. You should know that Sidon was not part of the kingdom of Israel. The people who lived there were not Elijahs people. They were not Jews, they were Gentiles. They werent descendants of Abraham, they didnt follow Gods laws, and, many times they were enemies of Elijahs people. Still, thats where God told Elijah to go, so thats where he went. Under the blistering sun, Elijah walked off to the town of Zarephath. When Elijah came to the town gate, he found a widow there. She was gathering up a few dry, dusty sticks. Well, that did it! This guy must be crazy! Didnt he know it hadn't rained for months?! There was barely any water, and hardly a scrap of food left. Sir, the woman said to Elijah, As sure as the Lord your God lives, I dont have any bread! At least the poor widow seemed to know there WAS a God in heaven, she just wasnt sure who he was, or why he was making life so difficult. But, no matter how bad things might have seemed, God was still there. What a simple plan for life! Don't worry. Make your plans, do what you think is best - but give to God first, and God will take care of the rest. And so, that is exactly what the widow did. And day after day there was water to drink and food to eat. The flour was not used up, and the jar of oil did not run dry - just as God had promised! One day at a time, God provided for Elijah and the widow. Now, the thing is, God didnt deliver 20 giant stone jars of oil to the widows door the next morning. She couldnt open her pantry, and find it filled with jars of oil. 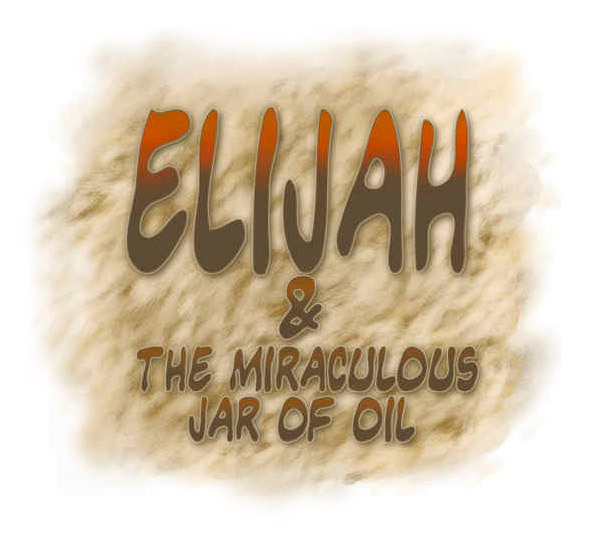 Elijah and the widow couldnt see where the oil was going to come from. They just had to trust that each day somehow there would be enough. They didnt put their trust in what they could see - that would be easy! Instead they learned to put their trust in what they couldnt see. And they learned a wonderful thing - trust in God, and God will provide! They didn't put their trust in their own riches, like King Ahab had, because, no matter how much they had - even if they had great store houses full of oil and bread - one day it would come to an end. But there is no end to God and his love for us. And that is worth more than all the treasures in the world.